In recent years, Nanjing's tourism industry has maintained a steady and impressive rate of growth, and the city has become one of the main tourist destinations in eastern China for travelers visiting from abroad. In order to introduce Nanjing to the world, the Nanjing Tourism Bureau has blazed a new trail by inviting the American author Roy Kesey to write this book, China through the Looking Glass: Nanjing. In it, he interprets the ancient culture and radiant scenery of Nanjing through a foreigner's eyes. Roy Kesey's books include his debut novel Pacazo, the award-winning novella Nothing in the World, two historical guidebooks, and an upcoming story collection called Any Deadly Thing. His first collection, All Over, made The L Magazine's recent "Best Books of the Decade" list. His short stories, essays, translations and poems have appeared in more than one hundred magazines, including McSweeney's, Subtropics, Ninth Letter and The Kenyon Review. Among other awards, his work has won two Pushcart Prize special mentions and the 2008 Missouri Review Editors' Prize in Fiction, and has appeared in several anthologies including Best American Short Stories, The Robert Olen Butler Prize Anthology and New Sudden Fiction. He is the recipient of a 2010 prose fellowship from the National Endowment for the Arts. He currently lives in Maryland with his wife and children. 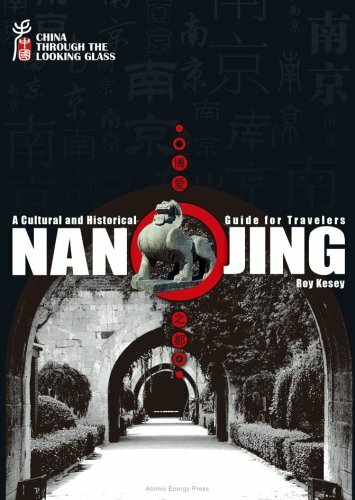 For any traveler, student, teacher, or resident in Nanjing, Roy Kesey's book is an invaluable guide to what could otherwise be an overwhelming amount of sites to see. He gives unbiased information, logically presented in a compact and readable format, allowing readers to gain a firm grasp on the history and culture of one of the world's great historic capitals without being bombarded by the facts. Recommended as required reading for before, during, and after a visit to any of Nanjing's sites. --Julie Sisk, editor, MAP magazine. In this well-informed and beautifully observed book, Nanjing at last has a guide worthy of its rich history and contemporary vibrancy. An elegant, engaging writer, Roy Kesey is the ideal guide to the mighty city on the Yangtze. His book avoids potted recitation of facts in favor of compelling historical anecdotes, scholarly quotes, and profiles of historical figures that breathe life into Nanjing's many tourist sites and inform its unique modern character. Leavened with humor and telling details, this book should inspire many visits to Nanjing. --Adam Pilsbury, Editor of the Insider's Guide to Beijing & Beijing Excursion Guide. I can't imagine anyone better suited than Roy Kesey to present Nanjing to the world. Focusing on the city's long history and vibrant cultural scene, and possessed of the 'magic talent of releasing flowers from his pen,' Kesey portrays the city vividly. As he notes, the mythological animal known as the bixie, with its head rising proudly to heaven, is the key to understanding the past and present of Nanjing. Both visitors and armchair travelers will find this book a joy to read. --Zhang Lijia, Author of Frog in a Well and co-author of China Remembers.